was a West Point graduate who attained brevet promotions to brigadier general and major general in the regular army on March 13, 1865 and major general of volunteers April 15, 1865 during the American Civil War. Custer, in the 1870’s, was dispatched to the west to fight in the Indian Wars. His disastrous defeat at the Battle of the Little Bighorn in 1876 resulted in his death along with his entire detachment. 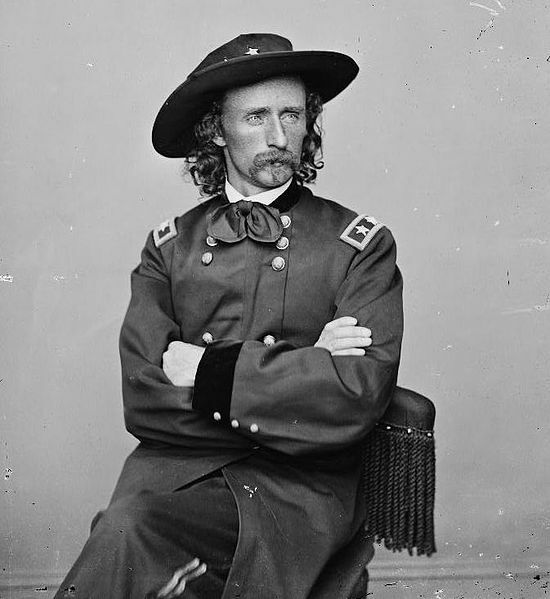 George Armstrong Custer was a West Point graduate who attained brevet promotions to brigadier general and major general in the regular army on March 13, 1865 and major general of volunteers April 15, 1865 during the American Civil War. Custer, in the 1870’s, was dispatched to the west to fight in the Indian Wars. His disastrous defeat at the Battle of the Little Bighorn in 1876 resulted in his death along with his entire detachment. CUSTER, George Armstrong, soldier, born in New Rumley, Harrison County, Ohio, 5 December 1839; died in Montana, 25 June, 1876. He was graduated at the U. S. military academy in June, 1861, and reported for duty at Washington. General Winfield Scott gave him dispatches to carry to General Irwin McDowell, then in command of the Army of the Potomac, he was assigned to duty as lieutenant in the 5th cavalry, and participated, on the day of his arrival at tile front, in the first battle of Bull Run. General Philip Kearny selected him as his first aide-de-camp, and he afterward served on the staff of General William F. Smith. While on this duty he was given charge of the balloon ascensions, to make reconnaissances. In May, 1862, General George B. McClellan was so impressed with the energy and perseverance that he showed in wading the Chickahominy alone, to ascertain what would be a safe ford for the army to cross, and with his courage in reconnoitering the enemy's position while on the other side, that he was appointed aide-de-camp, with the rank of captain, to date from 15 June, 1862. Capt. Custer applied at once for permission to attack the picket-post he had just discovered, and at daylight the next morning surprised the enemy, drove them back, capturing some prisoners and the first colors that were taken by the Army of the Potomac. After General McClellan's retirement from command of the army, Capt. 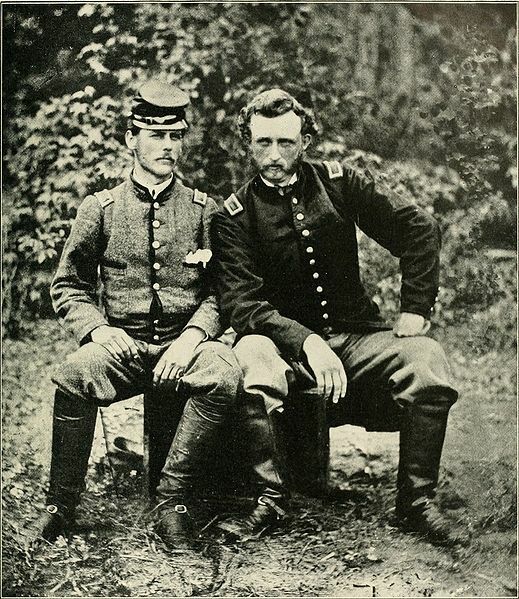 Custer was discharged from his volunteer appoint-merit and returned to his regiment as lieutenant. He had served there but a short time when General Alfred Pleasonton, on 15 May, 1863, made him aide-de-camp on his staff. For daring gallantry in a skirmish at Aldie and in the action at Brandy Station, as well as in the closing operations of the Rappahannock campaign, he was appointed brigadier-general of volunteers, dating from 29 June, 1863, and assigned to duty as commander of the Michigan brigade. At Gettysburg his brigade, together with those of Gregg and McIntosh, defeated General Stuart's efforts to turn the left flank. For this action was brevetted major in the U.S. army, to date from 3 July 1863. At Culpepper Court-House he was wounded by a spent ball, which killed his horse, he took part in General Sheridan's cavalry raid toward Richmond, in May, 1864, and was brevetted lieutenant colonel for gallant and meritorious services in the battle of Yellow Tavern, 11 May. In General Sheridan's second raid on Richmond the Michigan brigade made a most gallant fight at Trevillion Station; but so great was their peril that the colors of the brigade were only saved from capture by General Custer's tearing them from the standard, held in the grasp of a dying color-sergeant, and concealing the flag in his bosom. On 19 September, 1864, he was made brevet-colonel, U. S. army, for gallantry at the Bat­tle of Winchester, and on 19 Oct. he was brevetted major-general of volunteers for gallantry and meritorious services at Winchester and Fisher's Hill. On 30 Sept. he assumed command of the 3d division of cavalry, with which he fought the brilliant battle of Woodstock on 9 Oct., where his former classmate at West Point, the Confederate General Rosser, confronted him. He drove the enemy twenty-six miles, capturing everything they had on wheels except one gun. At Cedar Creek he confronted the enemy from the first attack in the morning until the battle ended. The 3d division recaptured, before the day was over, guns and colors that had been taken from the army earlier in the fight, together with Confederate flags and cannon. 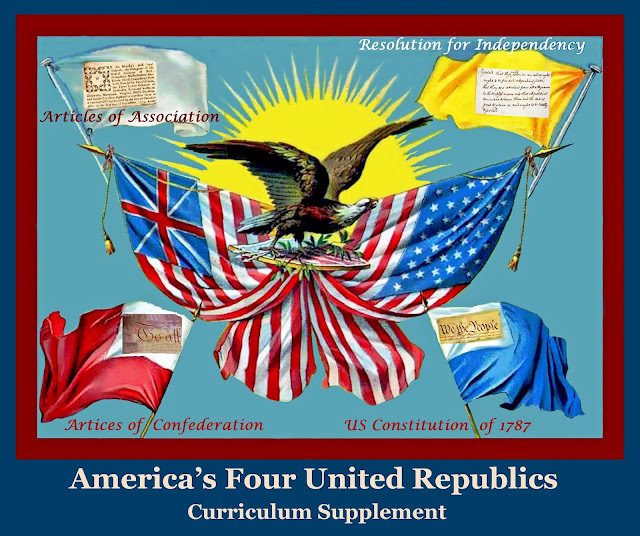 After this brilliant success General Custer was sent to Washington in charge of the captured colors, and recommended for promotion. "During the past six months, though in most instances con­fronted by superior numbers, you have captured from the enemy in open battle 111 pieces of field artillery, 65 battle-flags, and upward of 10,000 prisoners of war, including seven general officers. Within the past ten days, and included in the above, you have captured 46 field-pieces of artil­lery, and 37 battle-flags. 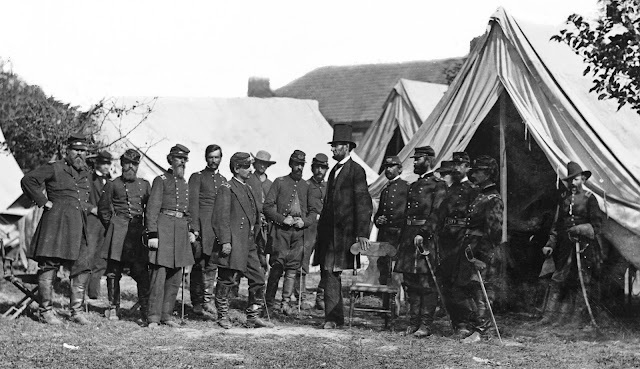 You have never lost a gun, never lost a color, and never been defeated; and, notwithstanding the numerous engagements in which you have borne a prominent part, includ­ing those memorable battles of the Shenandoah, you have captured every piece of artillery which the enemy has dared to open upon you." General Custer received the first flag of truce from the Army of Northern Virginia, and was present at the surrender at Appomattox Court-House. He was brevetted major-general for his services in the last campaign, and appointed major-general of volunteers, to date from 15 April, 1865." 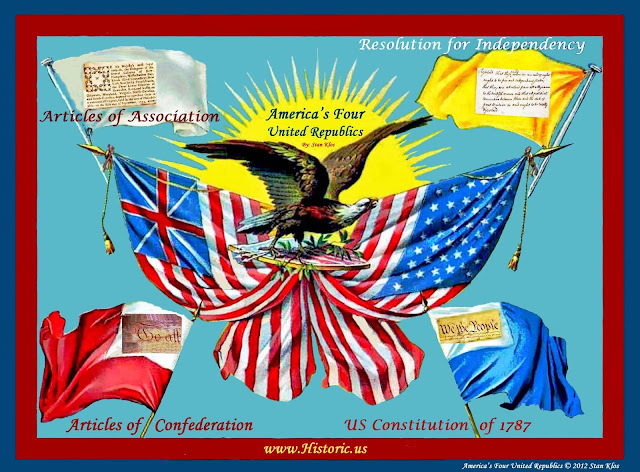 He par­ticipated in all but one of the battles of the Army of the Potomac. After the grand review he was ordered to Texas, to command a division of cavalry. 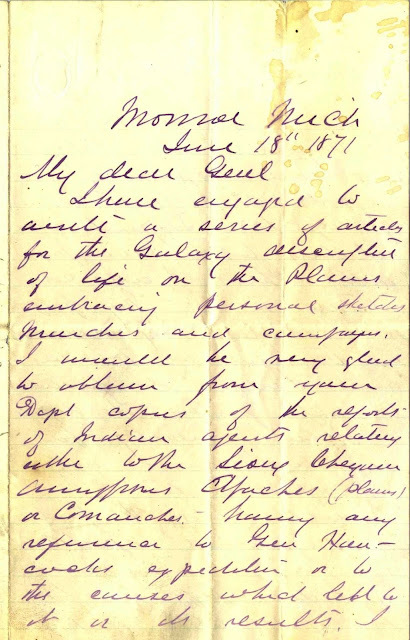 In November, 1865, he was made chief of cavalry, and remained on this duty until March, 1866, when he was mustered out of the volunteer service, to date from February, 1866. He then applied to the government for permission to accept from President Juarez the place of chief of Mexi­can cavalry in the struggle against Maximilian. 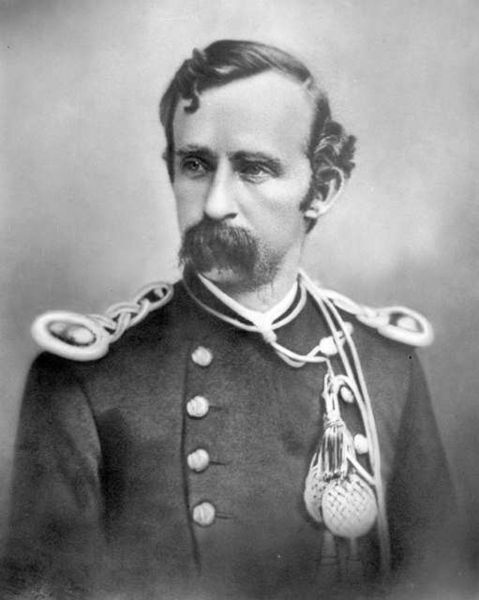 President Johnson declined to give the necessary leave of absence, and General Custer decided to accept the lieutenant-colonelcy of the 7th cavalry, his appointment dating from 28 July, 1866. He joined his regiment at Fort Riley, Kansas, in November, 1866, and served on the plains until 1871. On 27 November he fought the battle of the Washita, in Indian Territory, and inflicted such a defeat upon the In­dians that the entire tribe of Cheyennes were compelled to return to their reservation. He was ordered with his regiment, to Kentucky, in 1871, where he remained until 1873. In the spring of that year he was sent, with the 7th, to Fort Rice, Dakota, and from there accompanied an expedition to the Yellowstone. On 4 Aug. he fought the Sioux, with his regiment, on the Yellowstone, near the mouth of Tongue River, and on the 11th had another engagement three miles below the mouth of the Big Horn. In July, 1874, the government ordered an expedition, commanded by General Custer, into the Black Hills, which resulted in an unexplored region being opened to miners and frontiersmen. On 15 May, 1876, General Custer commanded his regiment in a campaign against the confederated Sioux tribes. The Indians were discovered encamped on the Little Big Horn River, in a region almost unknown. Eleven tribes, numbering nearly 9,000, had their villages on and in the vicinity of the Little Big Horn. The government expedition consisted of 1,100 men. The strength of the enemy not being known, General Custer was ordered to take his regiment and pursue a trail. He arrived at what was supposed to be the only Indian village on 25 June, and an attack was made by a portion of the regiment numbering fewer than 200 cavalry, while General Custer, with 277 troopers, charged on the village from another direction. Overwhelming numbers met them, and General Custer, with his entire command, was slain. The officers and men were interred upon the battle-field, and in 1879 it was made a national cemetery. A monument recording the name and rank of all who fell was erected by the U. S. government on the spot where General Custer made his last stand. In 1877 his remains were removed to the cemetery at West Point, N. Y.
Library of Congress Photograph from the main eastern theater of the war, Battle of Antietam, September–October 1862 - left to right. 1. Col. Delos B. Sackett, I.G. 2. Capt. George Monteith. 3. Lt. Col. Nelson B. Sweitzer. 4. Gen. George W. Morell. 5. Col. Alexander S. Webb, Chief of Staff, 5th Corps. 6. Gen. George B. McClellan. 7. Scout Adams. 8. Dr. Jonathan Letterman, Army Medical Director. 9. Unknown. 10. 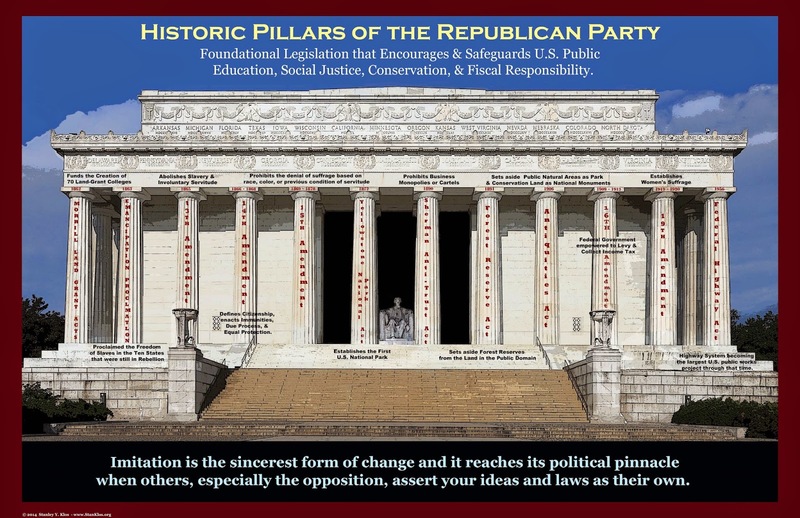 President Lincoln. 11. Gen. Henry J. Hunt. 12. Gen. Fitz-John Porter. 13. Unknown. 14. Col. Frederick T. Locke, A.A.G. 15. Gen. Andrew A. Humphreys. 16. Capt. George Armstrong Custer. He was nearly six feet in height, broad-shouldered, lithe, and active, with a weight never above 170 pounds. His eyes were blue, his hair and mustache of golden tint. He was a man of immense strength and endurance, and, as he used neither liquors nor tobacco, his physical condition was perfect through all the hardships of his life. Eleven horses were shot under him in battle. At the age of twenty-three he was made a brigadier-general, at twenty-five a major-general. The close of the war reduced his command from thousands to hun­dreds; but his enthusiastic devotion to duty was not diminished, and his form was seen at the head of his men in his Indian service just as it had been during the civil war. He reverenced religion, he showed deference to the aged, he honored womankind, he was fond of children, and devoted to animals. His domestic life was characterized by a simplicity, joyous contentment, and fondness for home that was surprising when it is remem­bered that, out of the thirty-seven years of his brief life, fourteen were spent in active warfare. One of his friends wrote his history under his name in one sentence, "This was a man." 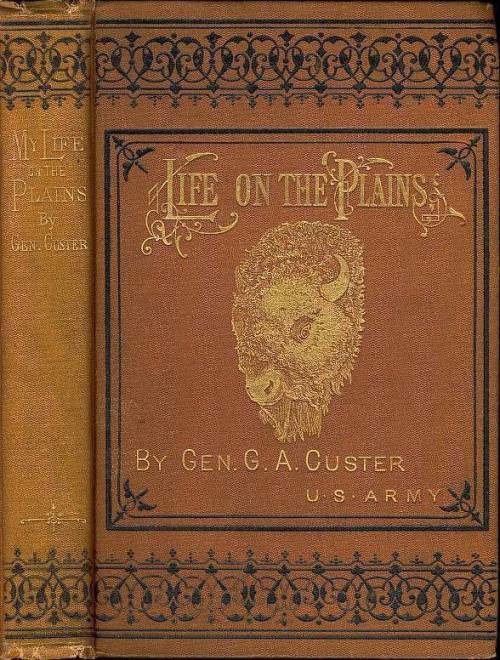 In 1871 General Custer began to contribute articles on frontier life to the "Galaxy," which were published in book-form un­der the title "My Life on the Plains" (New York, 1874). He was engaged on a series of "War Me­moirs" for the "Galaxy" at the time of his death. He occasionally contributed articles on hunting to "Turf, Field, and Farm" and "Forest and Stream." His life has been written by Frederick Whittaker (New York, 1878). 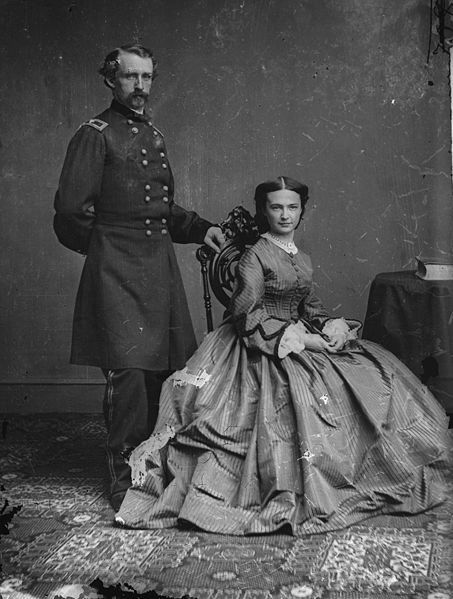 --His wife, Elizabeth Bacon Custer, whom he married in February, 1864, was with him at the front during the last year of the war, and also accompanied him in his nine years' service on the western frontier. She has pub­lished "Boots and Saddles, or Life with General Custer in Dakota" (New York, 1885), and is now (1887) at work upon a volume of reminiscences of the general's service in Texas and Kansas. --His brother, Thomas Ward Custer, soldier, born in New Rumley, Harrison co., Ohio, 15 March, 1845; died in Montana, 25 June, 1876. After repeated attempts, which failed on account of his youth, he succeeded in enlisting as a private in an Ohio regiment, and served in the west until he was made aide-de-camp on his brother's staff, then with the Army of the Potomac. 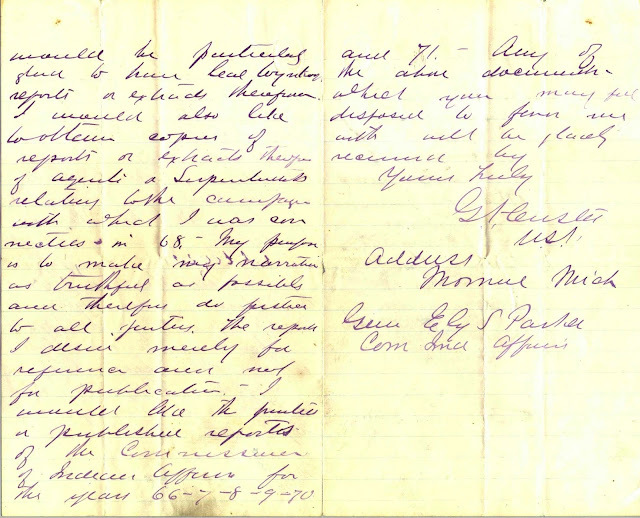 His appointment as second lieutenant in the 6th Michigan cavalry dated from 8 November, 1864. His horse was often neck and neck with that of his brother in the famous cavalry charges, and in tile fight at Namozine Church, 2 April, 1865, he captured a Confederate flag. At Sailor's Creek, 6 April, he captured a second flag, but was shot by the standard-bearer and severely wounded in the face. He was preparing to charge again, when stopped by his brother and told to go to the rear and have his wound dressed. 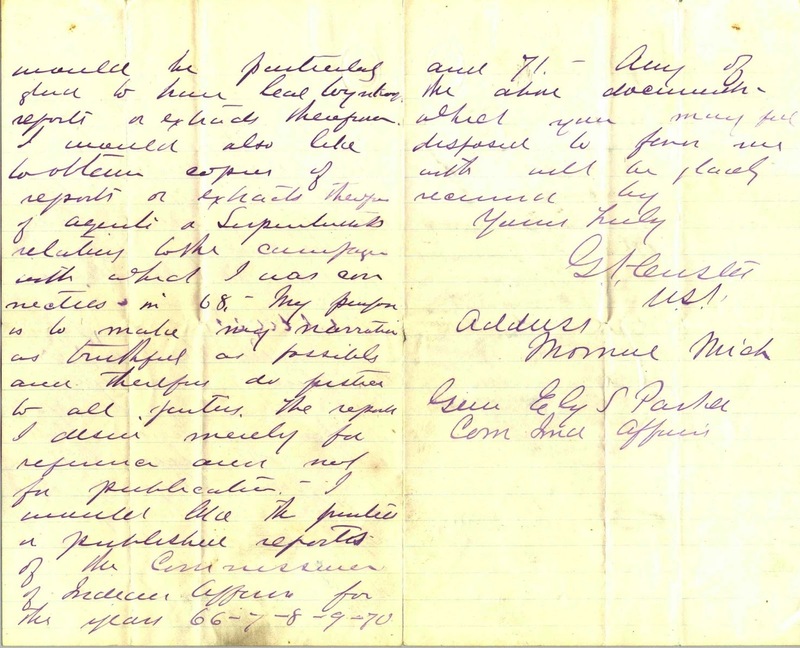 As he paid no at­tention to this request, it became necessary for General Custer to order him under arrest before he could check his ardor. He received a medal from congress for the capture of the colors at Sailor's Creek. "If you want to know my opinion of Tom, I can only say that I think he should be the general and I the captain." "My purpose is to make my narrative as truthful as possible." 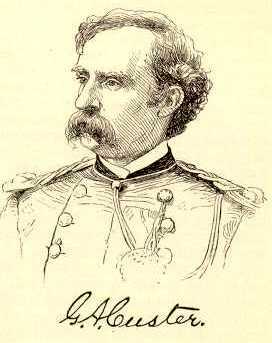 Custer was commissioned by the Galaxy to write a series of articles "descriptive of life on the Plains embracing personal sketches, marches and campaigns." 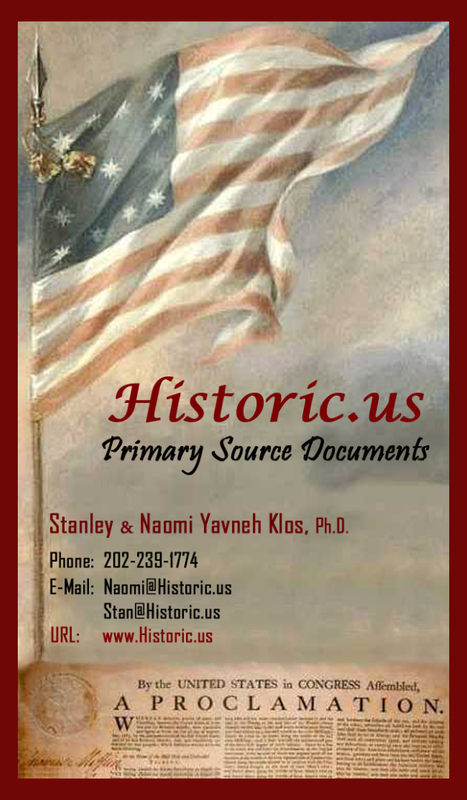 "Dept copies of the reports of Indian agents relating to the Sioux, Cheyenne, Arapahos, Apaches (plains) or Comanches." He especially was keen to have reports concerning General Winfield Hancock's expedition, which had resulted in Custer being court-martialed. The very tribes which Custer was researching and writing about in these rather authoritative essays were those that annihilated his troops at Little Big Horn. Custer's articles on the Plains Indians were first published in the Galaxy, volumes 13-18, 1872-1874, then in his book My Life on the Plains, or, Personal Experiences with Indians two years before his death in 1876.